Living a full life during menopause! MENOMEDIN® is a non-hormonal natural complex that will relieve the symptoms of the menopause! MEONOMEDIN® is a herbal complex with a unique balanced combination of the standardized extracts, with their active substances reducing the neurovisceral signs (hot flashes, night sweats), improving the psycho-emotional state (relief of anxiety, nervousness, nervous strain, depression), preventing the development of the age-related changes in the menopause (cardiovascular disorders, osteoporosis). the extract of red clover contains isoflavones that display an estrogen-like effect, bind to the estrogen receptors, helping to reduce hot flushes, sweats, and genital dryness. The active ingredient ginestein prevents bone loss, the development and progression of osteoporosis. The reduction of the cardiovascular risk is associated with the presence of isoflavones that contribute to vasodilatation and improve the lipid metabolism. The extract of cimicifuga root has an estrogen-like effect, binds to the estrogen receptors, and exerts its effect through the dopaminergic or serotonergic pathways, reduces the production of gonadotropic hormones, helping to reduce hot flushes and night sweats, improves sleeping during the menopause, and reduces the menstrual pain in the premenopause. Due to the presence of flavonoids and terpenes, the sage extract helps normalize hypothalamic overactivity caused by estrogens deficiency that contributes to the reduction of night sweats and hot flashes. Due to the effects of the active components on the cholinergic system, improvement in the cognitive function, memory, and attention is observed. The extract of St. John’s wort contains hypericine and hyperphorin that inhibit the reuptake of monoamines (dopamine, norepinephrine, and serotonin), have an effect on the GABA receptors, reducing the signs of depression, restlessness, nervous strain, anxiety, and insomnia. The extract of female ginseng ginseng contains ligustilide, polysaccharides, and ferulic acid that relieve the vasomotor menopausal symptoms, improve blood circulation, and have the antihypertensive, antisclerotic and antiplatelet effects. MENOMEDIN® is the best remedy created by the nature to help you during the menopause! NUTRITIONAL AND ENERGY VALUE (CALORIC VALUE) PER 100 g OF THE SUPPLEMENT: proteins – 15.0 g, carbohydrates – 1.1 g, fats – 0 g; 64.4 kcal (296 kJ). 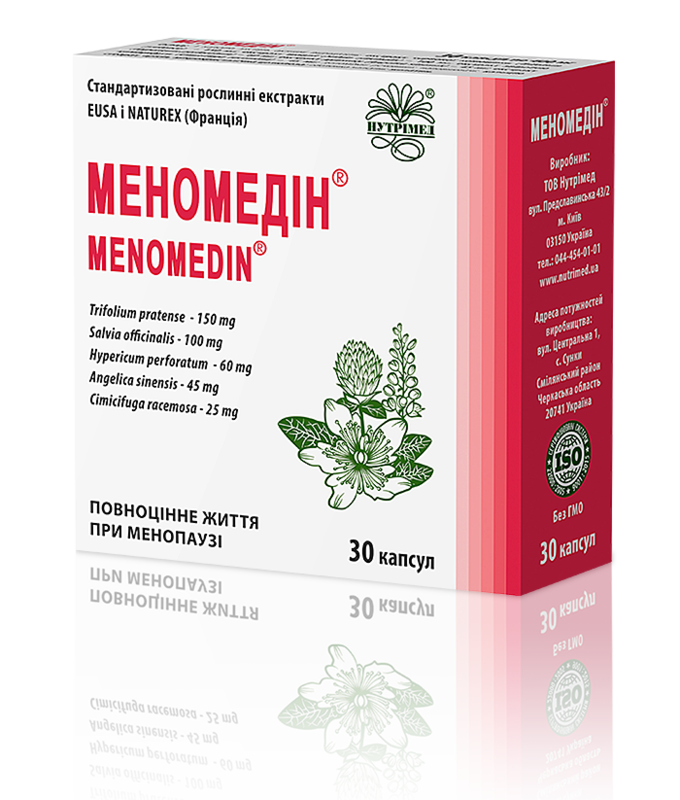 RECOMMENDATIONS FOR USE: MENOMEDIN® is recommended as a balanced complex of standardized herbal extracts to normalize the function of various systems and organs in a female body (nervous and reproductive systems, mammary glands, skin, bones) in the premenopause and menopause, alleviate the neurovisceral signs (hot flashes, night sweats, genital dryness) and improve the psycho-emotional state (in excessive nervousness, anxiety, nervous strain, depression, poor concentration power, insomnia), help a female body to adapt to the age-related changes at the time of hormonal rearrangement, prevent the development of osteoporosis and cardiovascular disorders in the menopause and postmenopause. METHOD OF ADMINISTRATION AND RECOMMENDED DAILY DOSE: adult women should take 1-2 capsules daily with or without meals swallowed with plenty of drinking water. The treatment course is 3-6 months. The course can be repeated if needed. STORAGE CONDITIONS: store in the original package in a dry place protected from light, out of reach of children at temperatures 4°С до 25°С.